Blueberry wheat bran muffins are a healthy and quick breakfast. Hearty and filling, these will get your day off to a great start! I love muffins. Who doesn’t love muffins? Do you favor the top of the muffin or the bottom? I’m a fan of the top. Does anyone prefer the bottom? 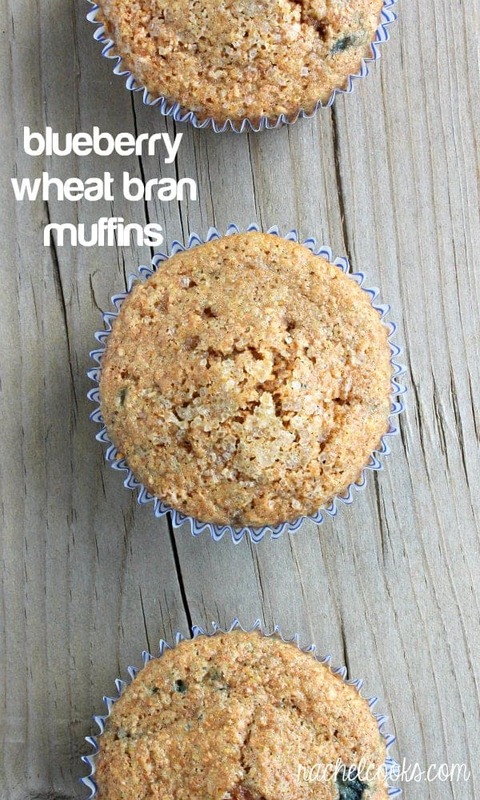 These muffins are hearty because of the whole wheat flour and wheat bran. They’ll leave you feeling full and satisfied–a great way to start the day or get you through those mid-afternoon blues. Plus they are easily adapted. Don’t have blueberries? Throw in some blackberries or raspberries. Chopped apples would be great this time of year too! 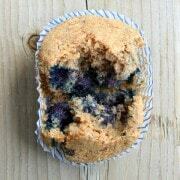 Blueberry wheat bran muffins are a healthy and quick breakfast. Preheat oven to 375 degrees F and line 12 muffin cups. Whisk dry ingredients in a medium bowl, set aside. Using a mixer, beat butter and sugar on high until light and fluffy. Beat in eggs and vanilla until combined. With mixer on low, alternate adding flour and buttermilk (about half of each at a time). Fold in berries. Divide into prepared muffin cups and sprinkle tops with turbinado sugar. Bake for 20-25 minutes, rotating halfway through. I used frozen blueberries, straight out of the freezer! Verdict: So good! I love the subtle texture from the wheat bran and the whole wheat flour..and then the nice crunch from the sugar on the top. Husband’s take: He swore these were the best muffins he ever tasted. Seriously! E of course scarfed them down too–they have “blue blues!” in them. Changes I would make: None are necessary. You could easily substitute any berry you wanted, though. Made these muffins for breakfast this morning (found through google search or maybe pinterest)…They were delicious!! My husband said this is definitely a make-again recipe. Thanks for sharing! any idea what the calorie content is for these yummy muffins? Nope, sorry Renee, I don’t calculate the calories for my recipes. I believe there are some online tools that you could enter the recipe into to calculate nutritional information. 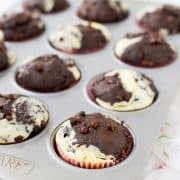 These muffins do have a fair amount of butter in them, so although they are good for you in the whole grains department, they aren’t necessarily low-fat. These look so soft and fluffy and bursting with good things! Yum! How ARE YOU?!!! Hope the little one is doing great. She’s such a cutie! blueberry muffins are classic. Yours look lovely! I love the blue hue in the center instead of the normal purple I get. I can never have enough blueberry muffin recipes under my belt. I love this one! Pinning! What a great looking breakfast or snack! Muffin tops all the way! Though, this one looks so good, I will happily eat the whole thing! Thank you! I wish I had a couple for breakfast this morning! 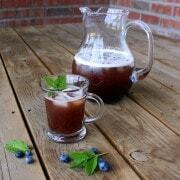 perfect I have a few bags of frozen blueberries I need to use up!! i love muffins AND i love bran (which i always feel strange saying, because it makes me sound like a fiber-loving weirdo), so these are right up my alley. YUM! I’m a muffin top girl too. They look like a great, healthy breakfast. I like the top, but the bottom is a-ok in my book, too! These look good… I <3 bran muffins! These sound great, love all the wheat goodness! I love all of the good for you things in these muffins! What a great way to start the day!! These sound really good. I may have to set aside my usual blueberry muffin recipe and give these a try. I like that they’re whole wheat, with the bran, and also with buttermilk for a little tang. Yum! 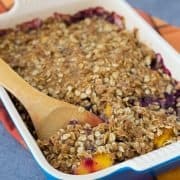 Love how these are just bursting with blueberries and have all those healthy ingredients too. I wish I had wheat bran so I could make these now. They look amazing! I am a huge fan of any muffin – these look great. I love the wheat bran in them! Love how adaptable these are! A perfect breakfast! These look great and I bet my kiddos would love them too! You know I’d have to split a batch of these… half blueberry and have apple. Oh yummmmm. Love all of the wheat goodness in these! !